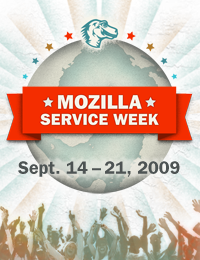 Mozilla is celebrating its very first Mozilla Service Week. During the week of September 14-21, 2009, we’re asking people to step up and make a difference by using the Web to better their community. Mozilla is a global community with a firm mission to make the Web better for everybody. Mozilla is looking for people who want to share, give, engage, create, and collaborate by offering their time and talent to local public benefit organizations, non-profits and people who need their help. – Teach senior citizens how to use the Web. – Show a non-profit how to use social networking to grow its base of supporters. – Install a wireless network at a school. – Create Web how-to materials for a library’s computer cluster. – Refurbish hardware for a local computer center. – Help a non-profit update its website or database.